Here is a short video of me juggling chainsaws at an event. I got some grass stuck in one of the chainsaws at first, so I had to dislodge it while everyone waited. Then I got it out and juggled the chainsaws. Yes, they are sharp and running. They are Makita battery operated chainsaws with a 4 and half inch chain bar. By God’s grace, I am living a dream. I get to do what I love and I don’t even feel like I work. But what I do is serious “work” at the same time. I get a lot of questions from people about what I do, so I thought I would try to consolidate the most commonly asked questions I get and answer them for you…. You’re joking, right? You’re not really a professional juggler. Yes, I’m joking. I made up the fact that I’m a professional juggler because that’s crazy, irresponsible, and nobody could make a living doing that anyway. Next question. No really. You are a professional juggler? Alright, I can’t fool you. I travel and do juggling shows for families and kids. It really is a fun job. So do you do running chainsaws? Yes. You’re joking. You don’t really do chainsaws. No, I’m not joking. I already used my one joke at the beginning of this conversation. I really juggle running chainsaws with sharp chains on them. If you don’t believe me, watch my YouTube video of me doing said act of insanity. Where do you travel? Do you travel, like, out of state? Yes, and sometimes out of the country. But most shows are here in the states, coast to coast. So do people like, pay for you to come out? Do they fly you out too? Most of the time, yes. I do some volunteer shows throughout the year, but most of my shows are compensated, including the travel. This is how I make a living. I’m not a bazillionaire and don’t expect to live the high life of luxury from it. But I love it and I feel blessed beyond measure. My family is provided for and we get to take fun trips together around the world. We have a paid-for roof over our heads, food on the table, and we love each other. I couldn’t ask for more. How do people find out about you? I work with a booking office that arranges my schedule. They represent a network of entertainers who provide shows for various events nationwide. People call them looking for a speaker/entertainer/act and I’m one of them. So you do like birthday parties? I have, but birthday parties make up about 0.5% of my shows in a given year. Most of my shows are for church events, school assemblies, or camp/retreat events. So you do a lot of churches? 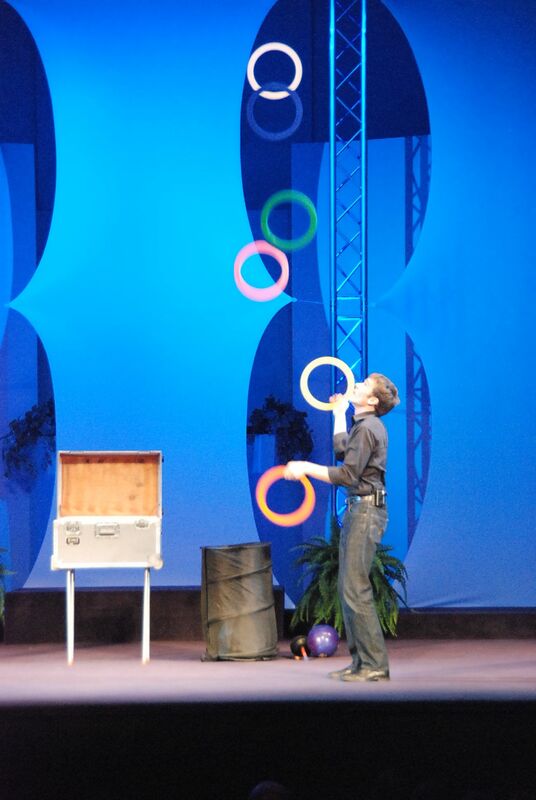 Yeah, in most of my shows, I combine my juggling show with a message about the Bible. I try not to be preachy. It turns out that juggling is a fun way to connect with kids and then teach them something positive. A lot of churches and Christian camps around the country are looking for creative ways to do outreach and Christian teaching to their kids and youth. This is one way and I’m happy to help be a part of these outreaches. How did you get into this? So a friend taught me how to juggle in middle school. I enjoyed the skill so much that I went to the library and got as many books as I could about juggling. I practiced for hundreds of hours, until I felt confident enough to perform for my high school variety show (by then I was in high school). That was my big break. The audience loved it (and I did too). From there, I was spotted by someone connected to a local party company. They started booking me for local shows (like birthday parties and grand openings). I did not seek it as a career. In fact, I felt called by God into ministry, like pastoring and/or teaching in the Church. So I went to college and seminary and studied the Bible, Theology, and Christian Education. Along the way, it all clicked and I realized I could do BOTH! I could teach others about the Bible AND do a juggling show at the same time. I developed a show that did just that, people found out about it, and it eventually turned into a full-time vocation. I have been doing it full-time since 2007. Do you have a family? What do they do? I have a wife and a daughter. My wife is a Licensed Professional Counselor (LPC) and works two days a week at a Counseling office here in Richmond, VA, where we live. Our daughter was born in 2010 and she is smart, funny, and loves ballet. My wife stays with our daughter most days and I get to be with her the two days that my wife is at work (unless I’m out doing a show, which is when we get a nanny/sitter). Do they ever travel with you? Sometimes, yes (usually only to the fun places, like St. Simon’s Island, GA). But most of the time they stay at home because the like the normal pace of things at home. They support me in my travels. I’m gone a lot in the Spring and Summer. But I’m home a lot in the Winter. I work out of the house when I’m home, so I get to be very close by when I’m not on the road doing a show. We like the rhythm we’re in and it works for us at this point in our lives. I tried juggling once and it didn’t go so well. I don’t have the coordination. I’m amazed at people who can do that. Well, at least you tried. And thank you for your kind words. We all have our own things that we’re good at. But, hey, somebody’s gotta be the juggler! Any other questions? Leave a comment if you have any and I’ll do my best to answer them! At first, this is very frightening. But after years of practicing the shorter unicycle, I found that once I took that first “leap of faith” onto the tall unicycle and rode it for a bit, it was just like riding the shorter one, just higher in the air. This was taken at Highland Lakes Camp in Spicewood, Texas at a camp for about 850 kids. 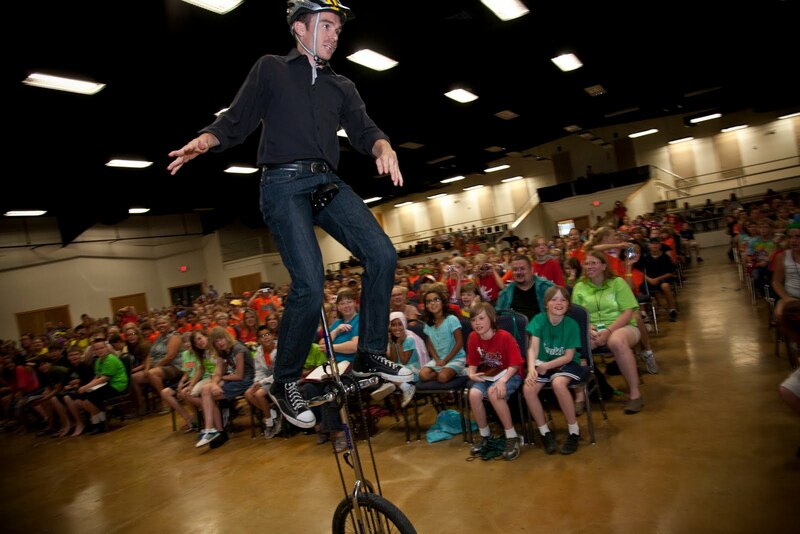 My next goal is to juggle while idling in place on the tall unicycle.